MDF radiator grilles provide the interior designer in you the chance to enrich your room styles whilst also delivering additional practical shelf space. The MDF radiator grilles, are available in a wide range of different styles and designs that add that extra touch of class to your room’s interior design. 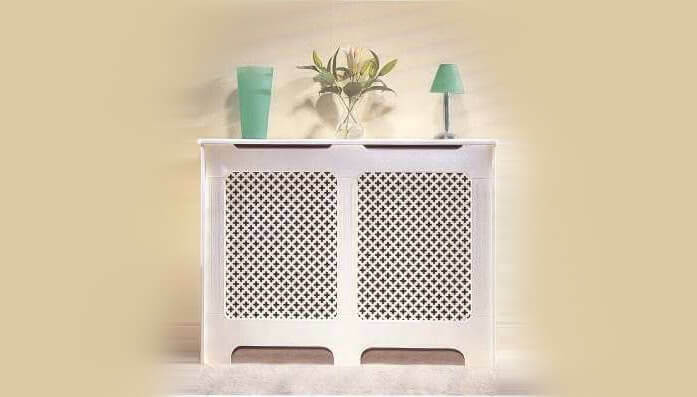 As well as enhancing your room’s interior design, MDF radiator grilles can also offer some additional practical uses. Provides an additional protective barrier from steam or hot water in the event of radiator leaks. The MDF radiator grilles are incredibly easy to fit, making them the ideal solution for situations where time is in short supply. The manufacturing techniques mean that designs are varied and means you will able to find the design that meets your design needs. Choosing from the wide selection of final styles means you have the option to have either a traditional or contemporary style dependent on your chosen decor. Here are a few examples of our MDF radiator grilles range if you would like some design ideas for your new interiors. If you would like to discuss your MDF radiator grille or would like some additional information, please give us a call or send us an email, we’ll be more than happy to help.